wood veneer peeling machine - Shandong Jinlun Machinery Manufacturing Co,Ltd. The emergence of CNC rotary cutting machine(wood veneer peeling machine) not only improves the quality and precision of the production veneer, but also greatly improves the production efficiency and machine automation. Rotary cutting machine (wood veneer peeling machine) is one of the main equipment for the production of plywood. Rotary cutting machine points card peeling machine, and no card peeling machine, a card peeling machine for large diameter wood, no card for the use of small diameter wood. Rotary peeling machine(wood veneer peeling machine) is one of the main equipment for the production of plywood, is divided into a card peeling machine cutting machine and non-card peeling machine, as technology advances digital servo control technology is also applied to the peeling machine production, in recent years Appeared NC rotary cutting machine. The emergence of CNC rotary cutting machine not only improves the quality and precision of the production veneer, but also greatly improves the production efficiency and machine automation. NC cardless peeling machine is an important equipment in the plywood production line or veneer production line. It is mainly used for secondary recycling of the remaining wooden chips Section, in a certain diameter range of wood core spin into a different thickness veneer, peeling diameter small. 1, Servo motor driven precision screw feed. 2, replace the plate thickness only enter the plate thickness figures, no need to change the gear, high precision peeling. 3, different types of wood can be together with peeling without affecting the thickness. 4, good surface finish, the wood is not sensitive to the reaction of the yin and yang. 5, energy-saving, simple operation, easy maintenance. 1. Rotary cutter The distance between the two chuck determines the length of the peeling wood section, which also decided to spin out the width of the veneer. It has a maximum distance and a minimum distance. Wood length should not be greater than its maximum distance, not less than its minimum distance. 2. The centerline of the card axis from the height of the machine bed determines the maximum diameter of rotary cutting wood D, D = 2H a 100 mm. The maximum diameter of the peeling section also depends on the maximum distance between the centerline of the card axis and the bed. 3. The length of the knife is generally 50 mm larger than the maximum distance between the two chuck heads. 4. The speed of the card axis is related to the transmission mode of the rotary peeling machine transmission and is determined according to the requirements of ensuring the best rotary cutting conditions. The current peeling machine can be divided into two types according to the rotation speed of the card axis during the peeling process. One is that the card axis speed is fixed; the other is that the card axis speed increases with the rotation speed of the wooden section. 5. The working feed rate is the distance traveled by the table (knife and ruler) per millimeter or less per minute of the mandrel, in millimeters / revolution or millimeters / minute. The feed speed determines the thickness of the veneer to be rotated. In order to get different veneer thickness, the rotary cutting machine is provided with a feed speed changing mechanism and a feed box. 6. The rapid advance and retreat speed of the bed is the moving speed of the bed leaving the wood section (wooden core) after the bed approaches the wood section before the peeling start and the end of the peeling rotation. In order to minimize the auxiliary time occupied by these actions, the rapid advance and retreat of the tool bed generally adopts a rather high speed. 7. Rough feed rate is the initial rotation of wood cutting round before the bed movement speed. In order to minimize the rotary roundwood wood section, roughing feed speed is much higher than the speed of fine screw into the knife. 8. The axial feed rate of the chuck shaft should make the retraction interval of the cutter bed and the release time of the wooden core equal. Axial movement of the card axis screw drive and hydraulic cylinder in two ways. 9. The diameter of the chuck determines the smallest possible diameter of the wood core during peeling. 10. The power of the main drive and the power of all the motors on the rotary cutter (in kilowatts) determine the thickness of the veneer that can be spun and the power consumption of veneer peeling. 11. Extensions peeling machine dimensions long, wide, high press the most prominent part of the machine measurement. The length and width determine the plant area required to install the machine. Wood veneer cutting machine is the main production veneer and thin wood equipment. In accordance with the direction of movement of the plane relative to the horizontal plane to the knife, then the wood veneer cutting machine can be divided into vertical and horizontal two categories; according to the direction of the plane relative to the length of wood fiber perpendicular or parallel, but also can be divided into Horizontal slicing machine and vertical slicing machine. 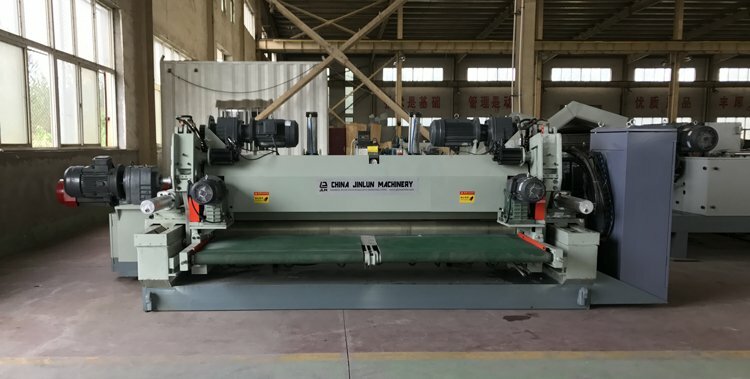 The dimensions of the modern slicing machine are only 1/3 of those of the past slicing machine, compact structure, light weight, easy installation and commissioning, continuous production, saving the time for installing the wood, high production efficiency, stable work, almost listening No noise. Rotary cutting machine is also one of the main equipment for the production of veneer, in a sense, than the slicing machine is more widely used. Rotary cutting machine according to whether the wood section around its axis of rotation can be divided into concentric and eccentric rotary peeling two categories. Concentric peeling machine is divided into card-axis peeling machine and card-less rotary peeling machine two. Eccentric peeling can obtain beautiful radial pattern, but the productivity is lower than the concentric spin. Rotary cutting machine is generally large in size and complex in structure, logs on the plane before the machine needs centering, if the center of the heart is not allowed, will start rotating out of intermittent veneer with a narrow veneer. Broken veneer or narrow veneer more, the loss of material is good sapwood veneer is more, is not conducive to the production of continuous. Logs are curved, irregular cross-section and both ends of the head (sharp taper) and other easily lead to spin out veneer to broken veneer, waste of timber. And when the log diameter is reduced to a certain extent, it can no longer continue peeling (that is, leaving the wood core to waste wood). Sliced veneer width is narrow, usually 300rnm have special requirements of the occasion. 1, low speed, high torque. Compared with the electromagnetic motor, the most significant feature of the ultrasonic motor is a large torque output characteristics at low speed. The torque density (moment weight ratio) of the ultrasonic motor is 100 to 1000 times the torque density of the electromagnetic motor. 2, the structure is simple and flexible, diverse forms of exercise. Ultrasonic motor is generally composed of stator and rotor (or moving body), and the stator and rotor of the motor can be very conveniently integrated with the fixed part and the moving part in the moving system. Ultrasonic motors have a variety of flexible structures such as rings, discs, square plates, cylinders and spheres, and are very easy to implement in many forms of motion, such as rotary motion, linear motion, two-dimensional planar motion, and three-dimensional motion. 3, life, noise and reliability issues. As the majority of ultrasonic motor drive is contact-type, which will inevitably bring the stator and rotor friction loss problem. At present, the continuous working life of the developed low-power ultrasonic motor is generally several thousands of hours. Ultrasonic motors have short life, poor reliability, and unstable work, which are problems that need to be solved urgently to restrict their practicality and industrialization. At present, however, the ultrasonic motor can still give full play to its advantages of large torque density, flexible structure, no electromagnetic interference and large static holding torque in some special work or special requirements on the motor. Ultrasonic motors are widely used in aerospace, finishing equipment, automotive industry, scientific instruments or medical devices with strong magnetic field or magnetic field, precision instrumentation, office automation equipment, micro-machinery, military and semiconductor processing industries and other related fields . Left and right or narrower, need splicing, low utilization of wood, and the production rate of slicing is only about 10% of the peeling; the currently used slicing machine only sliced thin wood.